When dropping students off in the morning, please use the morning loop around Massey Hall. Do not drive through the parking lot to drop students. In the morning, student drivers and campus visitors are parking and walking in the lot. Please help us to keep these pedestrians safe by using the designated morning drop off loop. Decoding Dyslexia Virginia invites TNCS parents to a meet & greet in the back room of the downtown Capital Ale House at 5:30pm on Monday, January 28. This will be a chance for DDVA folks from across the state, TNCS, Riverside, and various other schools to chat. Information about their upcoming Dyslexia Advocacy Day on January 29th will be discussed. Another friendly reminder that backing up your computer will save you time and worry should anything ever happen to your laptop. Time Machine is a built-in application on your Mac. 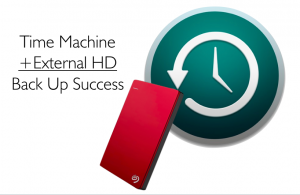 Getting a Mac compatible external hard drive and utilizing Time Machine will ensure your ability to get back on your feet quickly from a hard drive crash. If you need assistance getting started just reach out to Mrs. DelMonte, she loves to help students back-up their laptops! Ski Day permission forms were due this past Wednesday, but we will continue to accept them as long as there is room on the buses. Please turn in the permission form as soon as possible. Alternately, the form can be filled out electronically and emailed to Jason Carmichael. 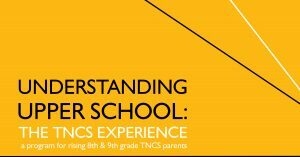 Families of 7th and 8th grade students are invited to “Understanding Upper School: The TNCS Experience” this Wednesday evening in Greenwood Commons from 7-8:30pm. Click here to RSVP. Speakers will include Adam Rothschild, Director of Upper School, Robin Forsyth, Language Fundamentals Department Chair, Kim Harley, College & Career Counselor, as well as an alumni parent and a current TNCS senior. Come enjoy an evening of fellowship and hear about the unique, student-centered experience the Upper School at TNCS has to offer. On Wednesday, as part of their unit on rocket engineering and the space program, the Physical Science class will travel to Rassawek Vineyards in Goochland to launch our model rockets. Click here for details and permission form. Please help us build school spirit and foster commitment to our school teams by encouraging your player to wear their team uniforms. All MS basketball players, boys and girls, have been issued TNCS school uniforms – jersey, shorts, warm-up shirt – and are expected to wear all 3 for all TNCS games. Players should not substitute personal clothing items for school uniforms, and need to wear TNCS uniforms to play in TNCS games. If you need to exchange a size, please discuss with your coach and do not wear outside clothing.